I look at the branch as it curls upward, or does it curl downward? Wait, that is its reflection. The bent and twisted branch arches and bends, its sprouts excursioning just a bit and one just like it follows suit, its mirror image. Still water does this. It makes a fool of you. Were I not so clever, I might reach for the wrong branch. Were I not so clever. But that branch below, so very near the surface, must see its fellow above. Unless there are ripples or wind or waves, unless the bright sun blinds it or silt buries it, that lake-locked branch must think it’s the real branch. In the stillness it might wonder at that impostor who dares to look down and mock him. Surely, he, there under the water is the real branch. Weighty, yes, damp, yes, sometimes dark and lonely and tumultuous. Real must fend for his life while that sunny, dim and oddly dimensional branch goes missing every time. On this still day, in these still waters, when the sun is low on the horizon, does that watery branch wonder at his fickle image above? If I came up out of the water, arose and shook off the weight that presses me down, what might I be? Is life as I know it not all of life? Is there more above the surface? Is that other branch real? Could it be even more real than I am? Perhaps heaven is like that. We think the murk and mud and tumult we are under is real but we get a glimpse – in the stillest moments – of something that mirrors our existence. Maybe, if we were just pulled from under the water, lifted above the abyss, we would see that it is real. Brighter, broader, fuller in dimension and grander in color, it would be the glorious real we thought we were all along. We are but a dim reflection, indistinguishable by the naked eye. It is such a human mistake to be taken in by such an optical illusion. Only in perfect stillness, at rising and setting of sun, do we glimpse real. Fully real. 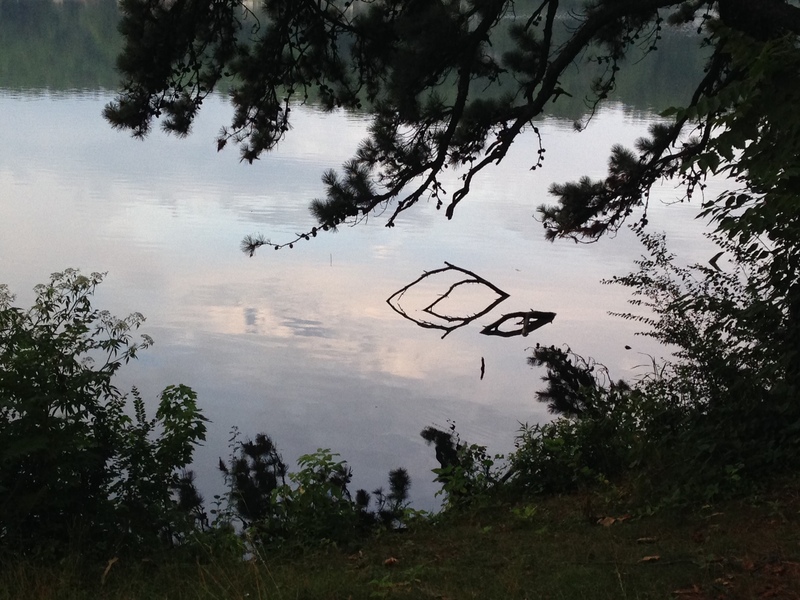 Funny things happen when you sit in stillness and look from the lake shore. Which branch am I? Where is the line between heaven and earth? When people pass, what do they pass? Where do they cross from here to there? If we’re headed toward something, shouldn’t we see it so we’ll know when we get there? I see you…. you line on the horizon. But you are fickle. Yes, as the sun rises, you take shape. But as the sun sets, you fade and I can’t see you anymore. Certainly not in the distance. Up close all I can see is darkness. It feels firm at my feet, yet I can reach into it. The air has a different texture. Which is you? Where are you? Where is the line between? Ah, when the sun rises, I’ll see! But wait: the fog obscures; the snow covers; the rain pelts; everything tosses to and fro in the wind. Where is the line? Where can I step to safety? Stand fast? Reach across? I just want to know where the border line is, so I’ll know I’m close. If I crossed and looked back, would I see it then? From over or beyond or within, would the line be clear between terrestrial and heavenly? Between what was earthly and what was not? No, I think not. Because Lord, when You stepped down from Kingdom into Dominion, You brought the line with you. Wherever You went, the Kingdom was. When you died and returned to heaven did you take this distinction with You? Did you erase the line? Obscure the evidence? Muddy the waters? Or did you leave it with us? As we enter our days, could it be that we cannot see the line between heaven and earth because it surrounds us? Actually encircling our travels, an amorphous heavenly goop (okay see-through slime if you will), that moves as we move. It goes before us and behind us and hems us in on each side. Perhaps the earth we see, the darkness and the poverty as well as the lightness and joy, we see through this heavenly plasma around us. Perhaps, it’s meant to tint our sight if we tune our eyes to just the right frequency. Oh, the strain and squint of the effort. My eyes need rest. I count on them for so much. How can I count on them for this? Why must I work so hard to distinguish lines on the horizon or boundaries near at hand? I want to trust that You are the line between and the passageway from here to there. Whether darkness or light, You are there in the middle. Perhaps I don’t need to know where the line is, just that it is. Perhaps there is no line, just a distance which is narrowed each time I reach out or over and feel for what’s in the darkness and pull it closer.